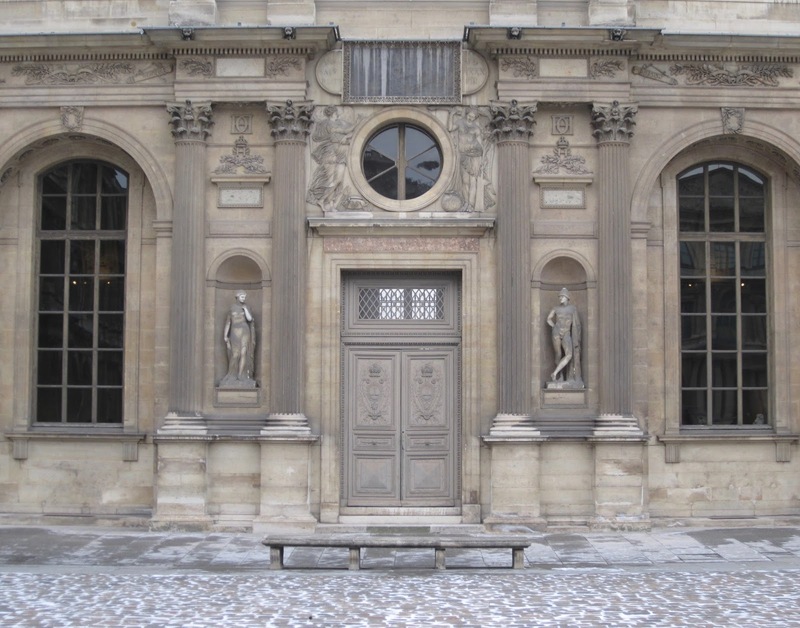 The Lescot wing in the courtyard of the Louvre palace is the oldest part of the existing complex. It is interesting for a variety of reasons, not least because it gives a French spin on an essentially Italian composition. The architect was Pierre Lescot, who was appointed in 1546 by king Francis I to remodel the medieval castle of the Louvre into a renaissance palace. Italian design had been influencing French art and architecture since the beginning of the 16th century. An Italian architect, Sebastiano Serlio, had already developed ambitious plans for a new Louvre and its interesting that a French project was chosen instead. The Lescot wing is probably France’s first classical façade in more than just a decorative sense and was, therefore, hugely important to the development of French classicism. One of the reasons Serlio’s project was rejected may have been that it was too huge. Lescot, therefore, proceeded cautiously. His project followed more or less the same footprint as the old castle, which was only demolished bit by bit. When he died, the west wing was finished and the south wing was partially completed, but the walls of the medieval castle still stood on the north and east of the old quadrangle. The original scheme seems to have been for a u-shaped building. A screen would have served as the main entrance to the courtyard from the east. This is similar to the contemporary Hotel des Ligneris (Carnavalet), which may also have been by Lescot. The plan was later reworked on a larger scale once Henri II came to power. Though clearly inspired by Italian palazzi, the roofline clings to the medieval tradition of towers. These towers, or pavilions, were to be built at the corners of the palace and was possibly inspired by the silhouette of the old castle. The only pavilion that was completed during Lescot's time was in the southwest corner. It still carries the original name, Pavillon du Roi, but its facade and cone-shaped roof have not survived. The courtyard is richly decorated with classical orders and low relief sculpture. The exterior of the palace, on the other hand, maintained a fortress-like sobriety and had no orders. Only the courtyard façade remains of the Lescot wing. It is heavily decorated, but according to a clearly defined hierarchy. Several of the novel features seem to have been determined by climate. The open arcades on the ground floor of Italian courtyards have been replaced with a blind arcade and recessed windows. This idea had already been introduced in the project to build a new city hall in Paris. The roof is the first known example of a double sloping roof, a feature which since has come to be known as a Mansard. It seems to have been used here to minimise the visual impact of the roof. The composition of projecting pavilions at the centre and the sides is also a feature not to be found in Italy, and introduces a vertical element unused by most Italian architects. The five-fold division would later be taken up in much of French palace design and emulated widely. What seems to have happened is that Lescot originally planned a central pavilion to indicate the location of the staircase. This was already established as a common French practice. However, due to practical considerations or the wishes of the king, the staircase had to be moved to one side. Instead of moving the pavilion to produce an asymmetrical facade, Lescot added a new pavilion, retained the central pavilion, and introduced a third pavilion for the sake of symmetry. Voila, the French five-fold palace design was born. The projections and recessions are in French usually referred to as avant-corps and arriere-corps. It allows for a new dimension of complexity, vertically as well as horizontally. For example, the pavilions are emphasised with engaged columns rather than just pilasters. They are also decorated with niches and swags. The emphasis is very much on alternating rhytms. The interplay of projecting and recessed panes existed in certain mannerist examples in Italy, but not to this degree. The use of oeil-de-boeuf windows above the windows and low relief sculpture, particularly on the attic floor, introduces additional complexity and variation. The projecting pavilions are capped with arched pediments that pierce through the roofline, while the windows have alternating triangular and arched pediments. It is almost as if as many alternating shapes and forms as possible have been crammed in. Yet, it doesn't feel too crowded in its effect. The relief work was done by Jean Goujon and his team, though the name Paul Ponce also shows up in certain sources. This was completed in 1549-56. The statues in the niches on the ground floor, however, were added in the period 1859-61, and the figure closest to Pavillon du Roi was only completed in 1892. The relief work is particularly profuse on the attic storey. The central frontispiece features two winged deities representing victory. The god and goddess of war, Mars and Bellona, are depicted in the panels below while the window is flanked with kneeling captives. The winged deities originally held a crown and the monogram included three fleur-de-lys. This was removed during the revolution and the letters RF were displayed until it was changed again after the Bourbon restoration. The crowned H, for Henri II, then took its place. The frieze on the first floor consists of children playing with garlands, in which the monogram of Henri II is entwined. There is another motif above the window, featuring a mask of Diana flanked with two lions. Diana was the goddess of the hunt and was probably an allusion to Henri II's mistress Diane de Poitiers. The same motif exists on the other two pavilions but with dogs instead of lions. I have been unable to find any information on the statues on the first floor but they seem to have been added in the second half of the 19th century. It could also be noted that Lescot used the composite for the columns on this floor. The composite is a sort of combination between Ionic and Corinthian and was considered the most decorative of the classical orders. Lescot broke with Italian conventions by using the Corinthian order on the ground floor. The entrance of the left and central pavilions gave access to the Salle des Caryatides while the one on the right leads to the Henri II staircase. The monogram of Henri II appears between the columns, including two where the H is entwined with two D's. This was once thought to be a reference to Diane de Poitiers but the D's are now believed to be crescents, which Henri II had chosen as his symbol. Many of the royal monograms on the Louvre combine the initials of the king and queen but to include a reference to your mistress would normally need to be more coded. Unlike the exuberant design of the courtyard, the Lescot's west front was originally quite plain. It was given a significant revamp in the late 1850's to harmonise with the new facades of Cour Napoleon, which had just been built. This included a blind arcade on the ground floor topped with statues. More statuary and a balustrade was also added to the roofline. Lescot's original design seems to have included the pediments over the first-floor windows. Lescot also started construction of the south wing, which was initially known as the Aile des Reines (Queens' wing) since it was intended to provide a bedchamber for a future Queen and the Queen Mother. The latter had been widowed when Henri II died in a jousting accident in 1559. The oldest son was crowned Francis II but died within the next 18 month and the throne passed to his younger brother Charles IX. The Queen Mother, Catherine de Medicis, acted as regent. The courtyard of the Queens' wing doesn't contain any of the original relief work. The attic was replaced with a full storey in 1806, which meant that the sculpture by Goujon and his team had to be chiselled off. Two winged figures representing Piety and Justice, dated to about 1565, were used to decorate the passageway of the east wing where they can still be seen. Some of the panels below the pediments were moved around to different locations but have been on display inside the Louvre since 1988. The relief around the oil-de-boeuf windows on the ground floor are from 1822-24, while the statues in the niches are from the second half of the 19th century.